Jacksonville has 221 days of sunshine a year. Eco-friendly homeowners are tapping into that Florida sunshine to reduce their carbon footprint. Solar panels — which can be expensive to install — are a natural fit for many homes. The benefits include lowering your monthly energy bill and helping eliminate carbon dioxide and air pollution. If more Americans committed to solar power, 8 billion metric tons of carbon dioxide would be eliminated from the atmosphere by 2050. Kudzu, cogongrass and tropical soda apple are three of dozens of invasive species in the Jacksonville metro area. Invasive species can crowd out native grass, and disrupt the ecosystem. Many invasive species hopped a ride on ships or were brought to Florida as souvenirs by unaware travelers. The First Coast Invasive Working Group invites north Floridians to round up those invasive plants that are taking over the environment. They also encourage homeowners to weed out invasive plants species on their property. Some homeowners are working to preserve native plant species. The Florida Native Plant Society promotes restoring native plants. Those species, which evolved in Jacksonville’s climate, are easy to grow and maintain. They help keep the ecosystem working smoothly. Planting native species is another way to decrease your impact on the environment. That leads us to the yard. This is a spot where homeowners can have a big impact on the environment. Lawns have gotten a bad rap recently, for not being environmentally friendly, but that’s not true. Lawns reduce erosion, cool the air and improve the soil. If you choose the right kind of grass (hint: Bermuda grass grows well in the Jacksonville area), a beautiful, green lawn is an asset to the environment. The good news is, the city of Jacksonville supports homeowners who are eco-conscious. Curbside recycling is available to anyone who has trash service in the city. 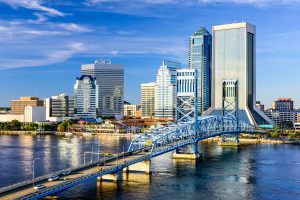 Even better, Jacksonville recently announced its curbside recycling program is taking more items than ever before, and there’s no need to pre-sort. Just put your recyclables in the recycle bin and make sure it’s on the curb on trash day. Unfortunately, old electronics can’t go in the curbside recycling bin. But that doesn’t mean you’re stuck throwing old cell phones and computers in the trash (or forced to stack up in the garage.) Sensible Recycling is a veteran-owned business that will take those old electronics and recycle them. Laptops, cell phones, televisions all have recyclable metal, plastic, and glass. Some even have gold, palladium or copper in them. A United Nations report says more 44 million metric tons of e-waste was generated in 2016 alone. Jacksonville homeowners who recycle old electronics are helping keep some of that out of the landfills. None of these five ways Jacksonville homeowners are becoming more eco-friendly has a big impact, alone. But as more Floridians take steps to go green, it makes the world a little bit better — and more likely a great place for generations to come. Marie Rodriguez is an eco-conscious home improvement writer and marketing representative for LawnStarter Jacksonville. She spends her free time roaming the beaches in Florida, and catching a wave or two when the tide is right on the Atlantic coast.